I started thinking about potatoes in the context of diversifying an organic upland sheep farm, Penbryn near Tregaron, which my friend had recently taken over from his father. It quickly became apparent that if the farm was going to be anywhere near viable, we would have increase the income significantly. Potatoes seemed relatively straight forward and required little additional investment in infrastructure especially when compared to, say, setting up a market garden or a poultry enterprise. I knew that the farm had produced potatoes in the past, albeit some 40 years ago. Some initial research turned up a number of old but serviceable pieces of machinery in the local area, a hangover from a time when potatoes were grown more widely than they are today. Standard data from the Organic Farm Management Handbook suggested gross margins of £1350/ ha. Even after I scaled down the yield to something I thought was realistic in West Wales I came out at around £900/ha which compared favourably to the £165/ ha for sheep. I had never grown potatoes on a field scale, but I do have horticultural experience and I therefore felt confident that I had some of the skills required and could pick-up the rest fairly quickly. And, to be honest, it was just something that I really wanted to do. Right from the outset I decided that growing ware would be difficult. The soil was well structured but quite heavy and the high rainfall could easily conspire to make it difficult to get on the land at critical times. In particular I thought the chances of getting a long enough dry spell in the Autumn to harvest were too small to take the risk. I also listened to the war stories of ware producers. They spoke of insecure markets, prices that somehow managed to be wildly fluctuating and consistently low at the same time and relentless pressure to get ever bigger to achieve the economies of scale demanded by an unforgiving and unrewarding market. It was not a place I wanted, or even could, be in. Seed, however, seemed to be a different ball game. By growing on contract, I saw that it was possible to attain a guaranteed market at a guaranteed price; and that the price fluctuations are much less of an issue. All of which made it possible, at least on paper, to operate a profitable enterprise on the sort of scale (1-5 ha) that I was considering. There are technical reasons, too. We are well away from the main potato cropping areas and therefore much more likely to be free from various pest and disease problems. 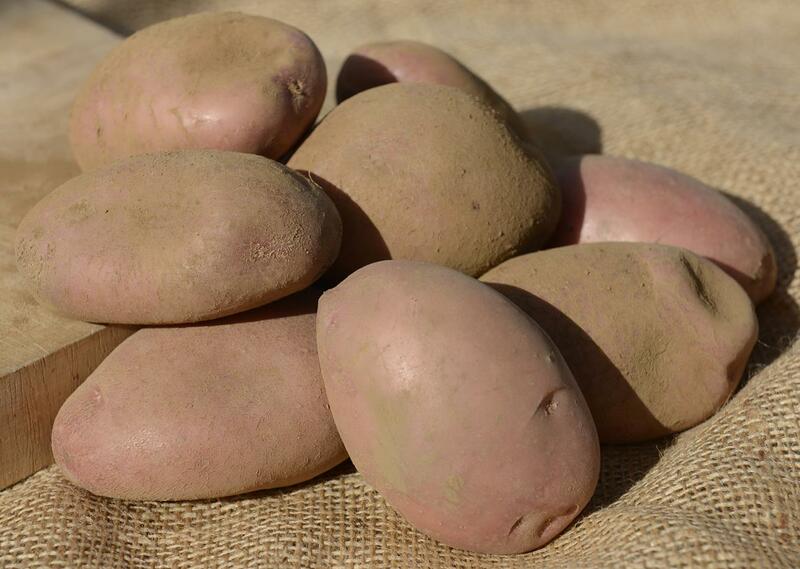 To grow seed, you must use land that has been free of potatoes for at least 7 years and that is not a problem here, at least in the short-medium term. Critically, with a seed crop you are aiming for smaller tubers. That means a shorter growing season which in turn means a late summer harvest when I was much more confident of decent spell of weather. Sárpo varieties are specifically bred for sustainable production systems and for an organic grower they are in many ways an obvious choice. In a production system where pesticides are heavily restricted, robust high resistance to late blight and virus is vital. Vigorous early growth to smother weeds is very important for me (this year I managed to get away with just one ridging up operation). Strong dormancy is a characteristic of Sárpos that I think is often under rated. It basically removes the need for cold storage over winter, something we did not have the capital for, and sprout suppressants, which are restricted under the organic standards. I started experimenting on a small scale in 2015, but really took the plunge this year. 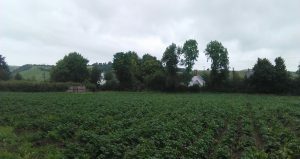 I’ve grown two varieties Shona and Axona – on 1.4 ha near Llanrhystud. There have been a lumps and bumps along the way (more of which in my next blog), but so far I’ve been pretty pleased with it all. I’ve just topped the second of my two varieties and harvest is about 3 weeks away; and the proof will be in eating of that particular pudding!